The Canadian Police Association held their General Meeting April 6-9, 2014 in Ottawa, Canada. Dr. Griffiths was invited to present on the Winnipeg Police Department Operational Review of the Winnipeg Police Department that he and Dr. Nahanni Pollard recently completed. 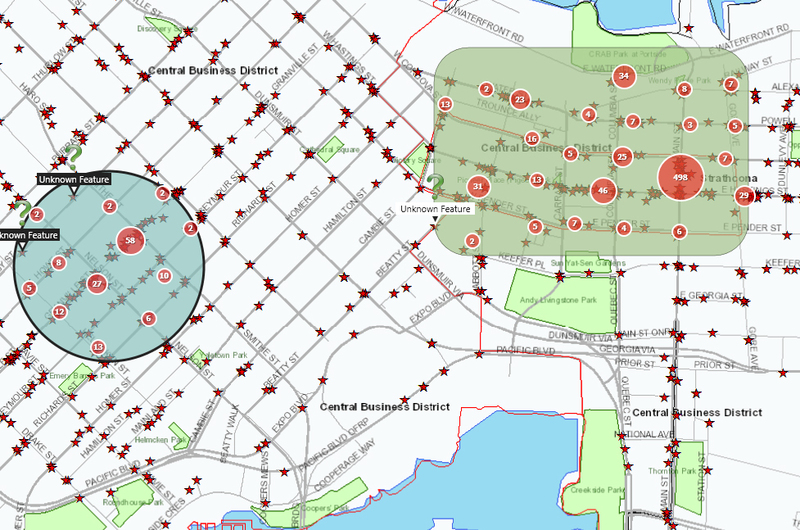 This geo-spatial chart, used in the course, illustrates incidents of violence and property crime in Downtown Vancouver. An online course offered by SFU’s School of Criminology this fall will give students the opportunity to practice their investigative skills in a one-of-a-kind virtual forensic criminal intelligence analysis lab. Curt Griffiths shared his knowledge on best practices in the area of civilianization, private and tiered policing based on his research. Dr. Griffiths spoke to the current state of police research in Canada. He indicated that there is no substantive body of evidence-based research, and very little connection between researchers, practitioners and policy-makers. Research is done in silos and there is no formal mechanism to share and disseminate new research to government and police decision makers. Claus Redder Madsen, Union Secretary of The Police Union in Denmark and The Nordic Police Union had a key message of safety and best practices for police officers in Quebec City, Quebec Canada Friday September 7, 2012. He spoke about a mass shooting on a island north of Oslo Norway and police response as well as a bombing incident. Watch an archived Google #hangoutsonair video of his presentation. Constable Scott Mills of Toronto Police Service and Crime Stoppers International did a talk on social media and the need for Police Associations to engage in the use of social media with purpose and process to achieve a payoff and potential for community success and safety relating specifically to Police Associations and protecting those who protect others. A criminologist welcomes the idea of a meeting between Nunavut RCMP and community leaders in Kimmirut, Nunavut. The meeting, scheduled for Friday, follows the latest gun violence last weekend which was aimed at Mounties in the hamlet. Curt Griffiths teaches at Simon Fraser University and advises on northern policing. “Obviously, this is the way to go – is to engage in a collective problem-solving exercise and to bring all the parties together and strengthen the contacts between the community residents and the service providers. I think those kind of initiatives have proven to be successful in the past,” he said.